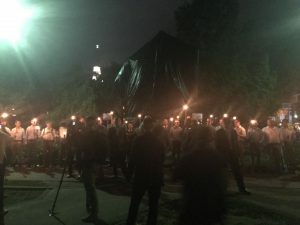 The statue glorifying Confederate General Robert E. Lee, which sits on Monument Ave. in Richmond, was vandalized in the early hours of the morning. 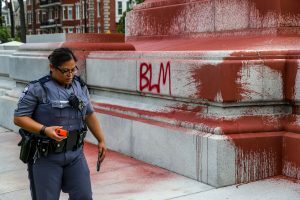 Dark red paint was splashed all over the plinth of the statue with the letters BLM written on the base – seemingly an acronym for the group Black Lives Matter. RVA Mag also spoke with an employee for the Department of General Services who was present at the scene to oversee the cleaning crew, who said he was called at 7:30 a.m. alerting him to what happened. At 9:30 a.m. the cleaning crew had not started power washing the statue, saying they were still waiting for the investigators to arrive. 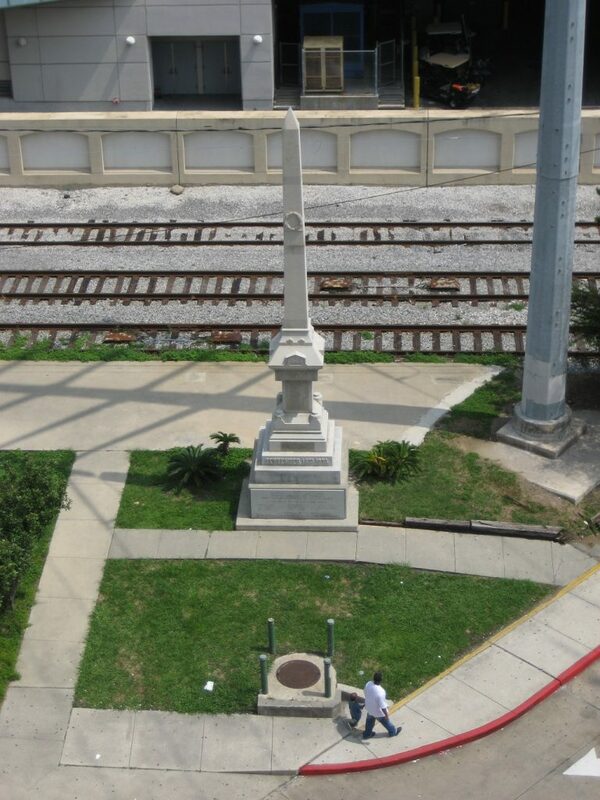 Richmond’s Confederate statues are vandalized frequently, with Jefferson Davis being spray painted twice in the past year. 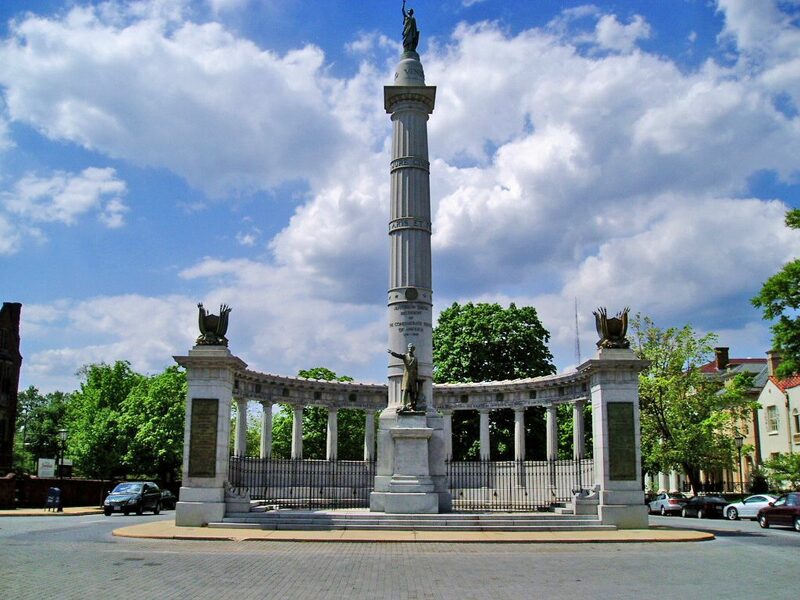 This comes at a time of contentious conversation surrounding the role of Confederate statues in public spaces and the finalization of a report by Richmond’s Monument Ave Commission, which recommended that Davis’ statue be removed. The Capitol Police reached out to RVA Mag at 1:30 p.m. to suggest that the paint used to vandalize the statue came from a “high pressured sprayer” or a refillable fire extinguisher. 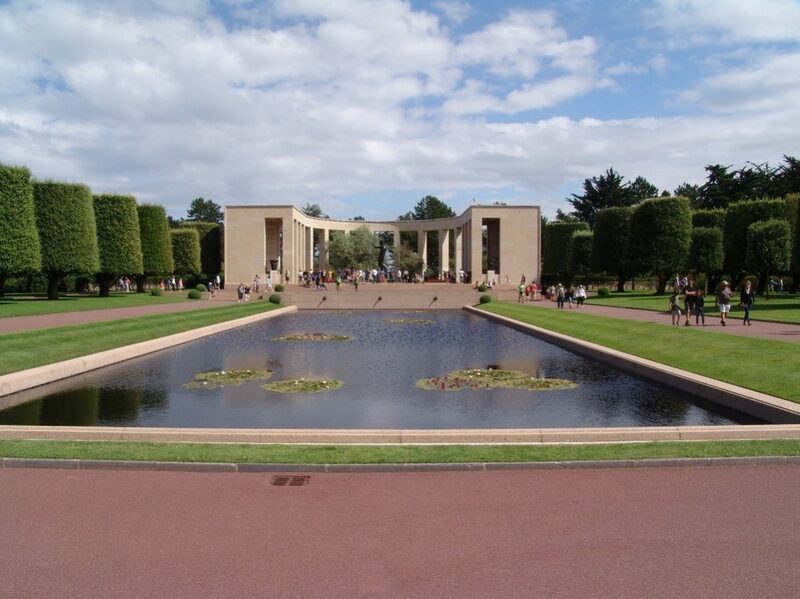 *This story has just been updated. 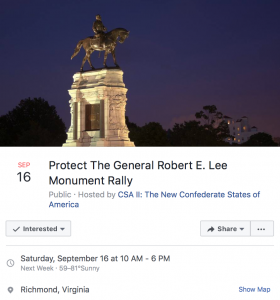 According to a Facebook event page sponsored by CSA II: The New Confederate States of America, a rally is being planned on September 16 to “protect” the statue of Confederate General Robert E. Lee on Monument Ave. A previous rally was planned by the Virginia Flaggers on the same date, but was later cancelled due to public pressure on the organizers. The group hosting the rally, CSA II: The New Confederate States of America, looks to be based out of Dandridge, Tennessee and claims to be “The Official Provisional Governmental Organization of the New Confederacy, protecting our Proud Southern Heritage, The Confederate Flag, our rights and values, and our way of life.” While the organization’s webpage claims to be veteran ran and explicitly states, “We are not a hate organization nor will it be tolerated in any way!! 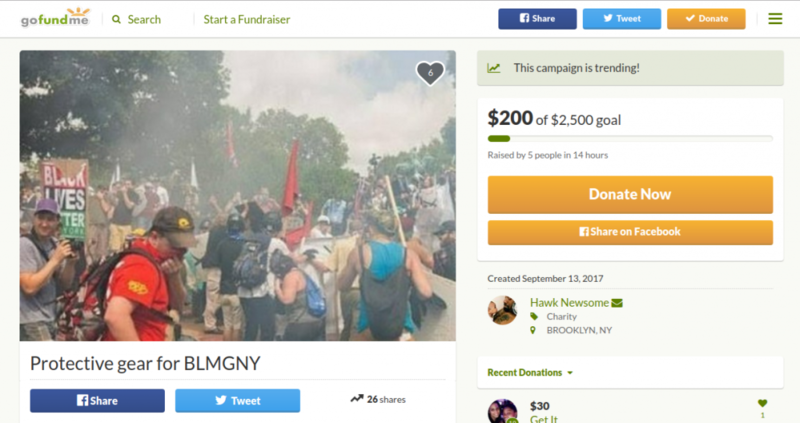 !,” Confederate symbols have become a national flashpoint for white nationalist, supremacist, and alt-right groups looking to grow their message. 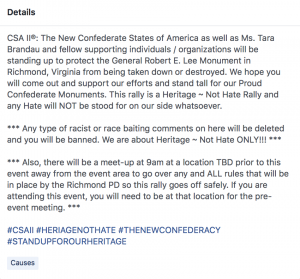 This rally, if happens, will come at a critical time for the city of Richmond. 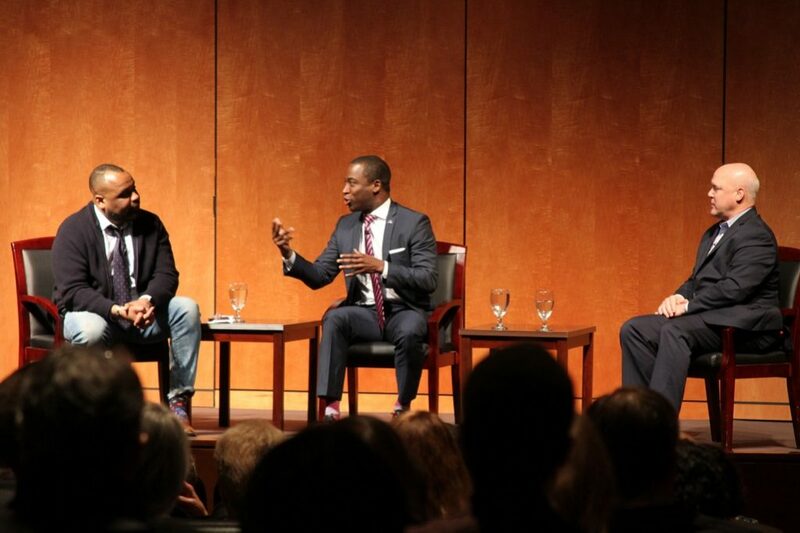 More so, because the city is still grappling with the direction of Mayor Stoney’s Monument Avenue Commission and recent comments signaling his willingness to consider a plan for removal of Confederate Statues.